Nečas Center for Mathematical Modeling is a collaborative effort between the Faculty of Mathematics and Physics of the Charles University, the Institute of Mathematics of the Academy of Sciences of the Czech Republic and the Faculty of Nuclear Sciences and Physical Engineering of the Czech Technical University. One of the basic aims of the Nečas Center for Mathematical Modeling is to establish a scientific team studying mathematical properties of models in continuum mechanics and thermodynamics and to promote collaboration between members of the team and world renowned scientists. Another aim of the Nečas Center for Mathematical Modeling is to initiate Czech researchers to study new mathematical methods. To this end the experts, with research fields connected to the scientific program of the Nečas Center, are invited to present courses. The goal of the Lecture Notes of the Nečas Center for Mathematical Modeling is to record these courses. Instructions for authors contributing to the Lecture notes are available here. So far the Center published the following lecture notes: Product integration, its history and applications, Reviews in geomechanics, Topics on partial differential equations, Topics in mathematical modeling, Qualitative properties of solutions to partial differential equations, Anisotropic function spaces and maximal regularity for parabolic problems (Part 1: Function spaces). 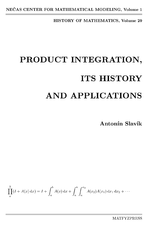 Volume Product integration, its history and applications is devoted to the theory of product integral, its history and applications. 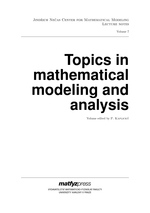 The volume was published jointly with Department of Mathematics Education in series History of Mathematics. 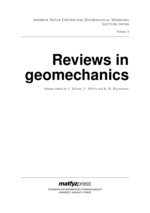 Reviews in Geomechanics (Lecture notes from Workshop on Geomaterials held in the Center in September 2006). 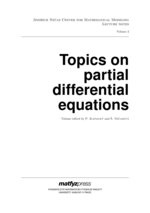 Topics on partial differential equations (lecture notes from various courses given in academic year 2006/2007 by guests of the Center). 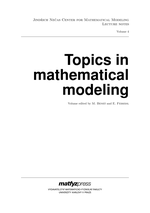 Topics in mathematical modeling (lecture notes from various courses given in academic year 2007/2008 by guests of the Center). 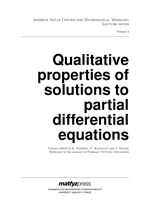 Qualitative properties of solutions to partial differential equationsl (lecture notes from various courses given in academic year 2007/2008 by guests of the Center). This work contains a detailed and widely extended version of a series of lectures on maximal regularity theory presented at the Jindřich Nečas Center for Mathematical Modeling in Prague, in October 2007. Topics in mathematical modeling and analysis (lecture notes from various courses given in academic year 2010/2011 by guests of the Center). 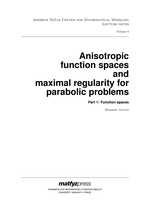 We are preparing the second part of Herbert Amann's treatise on maximal regularity for linear parabolic systems.